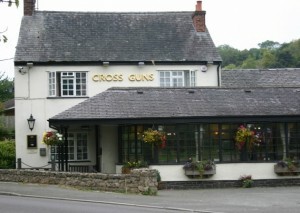 The Cross Guns Inn in Pant is our friendly local serving a range of food, real ale and a selection of wines and spirits. Situated on the A483 in the middle of the village the Cross Guns prides itself on its well-kept beers. The Cross Guns is situated on the corner of Briggs Lane, towards the south of the village. Facilities include: restaurant, beer garden, car parking, pool table and darts. The Cross Guns serves food every day of the week and has a number of special offers on different nights, so it is always worth a trip down to see what’s on offer! Tel: 01691 839631 to find out more or visit the Cross Guns Facebook Page. Wheelchair accessibility: The pub is accessible to people using wheelchairs although there is no disabled toilet.